Doom conquered the United States in 2099, made himself President and did what you’d expect Doom to do in that position. It’s worth noting that he also became a God of his own universe in 2015’s ‘Secret Wars’, so this President thing isn’t that impressive. (2) LOWERING THE BOOM. It’s not only the blowing up part that’s dangerous for humans. The wastes are, too. The Verge explains “How Hollywood and the Army are shaping the future of fireworks”. Another ingredient in fireworks, called perchlorate, helps the fuel combust and makes the colors shine more brightly. But it’s also thought to be toxic, which is why the Environmental Protection Agency regulates how much of the stuff can seep into drinking water. As with air pollution, it’s not completely clear the extent to which fireworks displays contaminate water systems with perchlorate. But a 2007 study conducted by EPA scientists found that perchlorate levels in Oklahoma surface waters increased by between 24 to over 1,000 times baseline levels after an Independence Day display — and it took from 20 to 80 days to go back down. Scientists with the US Army’s Armament Research, Development, and Engineering Center (ARDEC) are trying find a cheap, effective replacement for perchlorate. For the military, which uses pyrotechnics to mimic actual battlefield conditions in training simulations, perchlorate contamination of groundwater can shut down training operations. “When soldiers get deployed to real combat theaters, they are less prepared,” says Jared Moretti, a scientist with ARDEC who specializes in pyrotechnics. (3) A CHANCE TO HELP. In the aftermath of Dwain Kaiser’s death, a GoFundMe has been launched to assist his widow. We are raising money to help his wife, JoAnn Kaiser, who is in her 80s and lives well below the poverty level. Dwain and JoAnn owned one of the last used bookstores in Pomona, not because they made a enough money to live on, but because they loved educating our community. More importantly, they loved BOOKS. JoAnn is unable to cover the overwhelming expenses she will incur during this time of great loss: funeral, a memorial service, moving, and paying store bills. We reach out to all of you for support. Any assistance you can provide will impact JoAnn’s ability to grieve the loss of her best friend and husband without the burden of wondering how she is going to survive financially. All proceeds will go toward Dwain’s funeral, a memorial service, and moving expenses. The goal is $10,000, and at this writing they are halfway there. (4) LORD OF THE RINGS SETTLEMENT. Yahoo! Movies, in “Warner Bros., Tolkien Estate Settle Massive ‘Lord of the Rings’ Lawsuit”, reports the parties have reached agreement. Warner Bros. and the estate of J.R.R. Tolkien have resolved a rights dispute over “The Hobbit” and “The Lord of the Rings,” the two parties said in a court filing. The gist of the suit is that their agreement allows the studio to create only “tangible” merchandise based on the books, not digital products like the Lord of the Rings: The Fellowship of the Ring: Online Slot Game. …The suit also complained the defendants had asserted rights to exploit the books through anything from ringtones and downloadable games to hotels, restaurants and travel agencies. (5) DC AT SEA. Batman features in the new livery some Italian ferryboats — “Batman jumps on board the new Tirrenia ships”. Tirrenia, partnering with Gruppo Onorato Armatori and Warner Bros. Consumer Products, has started a great restyling of their ferry ships. The classical white and blue livery will progressively be substituted by the DC Superheroe par excellende: Batman! 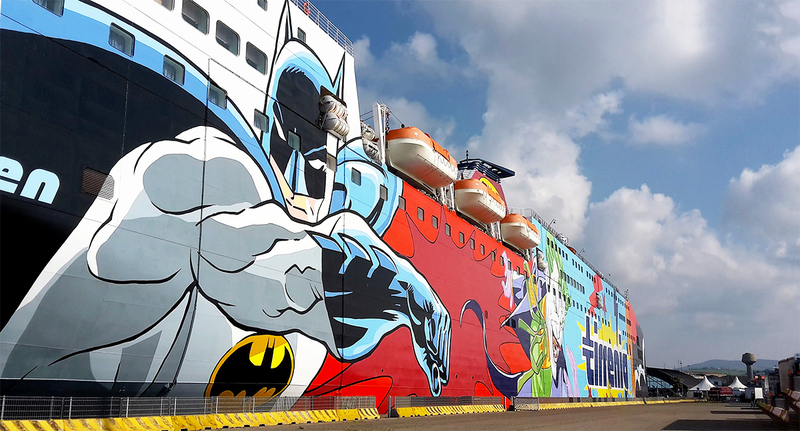 Sharden, docked today 7th April of 2017 at pier 18 of the Port of Civitavecchia, is one of the first Tirrenia ships to wear the new colours: both sides of the ships are different from one another: at one side are Batman and Robin, at the other Batman with his fierce enemy, the Joker. The Department of Veterans Affairs has approved the hammer of Thor (the Norse god of thunder and lightning) as a religious symbol for veteran gravestones. Two soldiers have headstones bearing the hammer. July 4, 1865 — Lewis Carroll’s Alice’s Adventures in Wonderland was published. July 4, 1939 — Julius Schwartz ditched the last day of the first World Science Fiction Convention and went with Mort Weisinger and Otto Binder to see a ballgame at Yankee Stadium. He still got to see fan history being made. Baseball fan history. A very special thing happened that afternoon: Lou Gehrig announced his retirement from the game of baseball. There wasn’t a dry eye in the house. It’s something I will never forget. For the past two weeks you have been reading about a bad break I got. Yet today I consider myself the luckiest man on the face of the earth. (8) THE FIRST COUNCIL. Noting with pleasure that the President has reestablished the National Space Council, Jerry Pournelle remembers the final achievement of the original Council of which he was part. When the Bush I administration took office, most of the Reagan people were replaced by Bush supporters. As a Reagan man – I chaired the Citizens Advisory Council on National Space Policy that in 1980 wrote the Space and Space Defense policy papers for the incoming Reagan administration – my White House access and contacts effectively came to a halt. There were no more Reagan men in the White House. However, there was the newly created National Space Council, headed by the Vice President, Dan Quayle. Mr. Quayle was not a space cadet, and hadn’t been well known in the pro-space community. Until the day he was asked to be then Vice President George H. W. Bush’s running mate, he was referred to as “the distinguished junior Senator from Indiana”, and generally well regarded; the day after he joined the ticket he became a buffoon not to be taken seriously by the very same news media. However, he took the post of Chairman of the National Space Council seriously, and when the Citizen’s Advisory Council proposed an X project, the SSX, he met with General Dan Graham, rocket genius Max Hunter, and council chairman Jerry Pournelle. We presented our proposal for the SSX, a 600,000 gross liftoff weight (GLOW) single stage to orbit (SSTO) X Project; as Max Hunter said, we hoped it would make orbit; it would sure scare it to death. It would also be savable; and it could be flown sub-orbital. Of course it was fully recoverable. The preliminary design description was done mostly in my office, with visiting members of the Council working on it. Mr. Quayle listened to us, and the asked advice from his technical people. He was told that recoverable single stage to orbit was impossible and had been proved to be so in a RAND study. Mr. Quayle then asked RAND to review that study, which they did, and Lo! It turned out not to be impossible after all. It was a possible X Project. Mr. Quayle tried to get it funded; apparently he took us quite seriously. He was unable to get full funding, but he did get Air Force funding for a scale model. Douglas won the competition for that X project, and it was built, on time and within budget, and delivered to White Sands test range for flight testing. It became known as the DC-X (Douglas Aircraft gave all their aircraft, such as the SC-3, that kind of designation). One big controversy about vertical rocket landings was that it could not be controlled at low altitude and the speeds involved. Another was that it would re-enter nose down, and wouldn’t be able to turn tail down. DC-X flew 10 successful missions, landing and being refueled and flown again; there are plenty of reports on that. On one of those missions it went from nose up the nose down, then back to nose up in which orientation it made a perfect landing. Alas after the 10th flight the Air Force turned the ship over to NASA. On the eleventh mission, it successfully landed, but a NASA technician had failed to connect the hydraulic line to one of the landing feet, and it fell over. It could have survived that, but due to over vigorous (and needless testing) the NASA test people cracked the hydrogen fuel tank, then welded it and sent it to fly. Falling over cracked that tank and DC-X literally burned on the ground a hydrogen leaked out. Mr. Clinton won the 1992 election, and in 1993 abolished the National Space Council. President George W. Bush did not revive it, nor did President Obama. (9) BREAKING OUT. The Verge interviews “Fantasy author Myke Cole on grounding a medieval world with demons in it”. …For his next act, Cole is changing things up a bit. His upcoming series, The Sacred Throne, exchanges the modern-day world that he’s been using as a setting for a more traditional fantasy realm. The Sacred Throne series is very much a modern-day fantasy thematically, but more on the “grimdark” side of the genre in the vein of authors like Joe Abercrombie, Mark Lawrence, or George R.R. Martin than the more optimistic worlds of Tolkien or Lewis…. Why the change from the more urban fantasy setting from your Shadow Ops series to something closer to traditional swords and sorcery? This book is super important me. So the Shadow Ops series, when it sold and when it got praised, it was always the authentic military voice. I think I might have been the only currently serving military member writing. At the time I was still on duty to the Coast Guard when that book came out. There’s a lot of retired military guys writing, but I don’t know anyone who is actually active and writing, which is what I was doing. So I kept getting praise for my “authentic military voice.” I was just kind of like, “Okay, I’m glad that people like this, and I’m definitely happy if it sells books,” but the truth is that you start to think “Well, is this a gimmick?” Do people like my writing because I’m a good writer, or do people like my writing because it’s authentic and it’s a military voice? And of course that set me up for kind of growing insecurity, and so it became very important to me to prove to myself that I was a writer with a capital W. That I can do other things. (10) PRETENDERS TO THE THRONE. They make number one sound far ahead of the other four — “Five Writers Who Could Be the Next Stephen King”. The number one writer who could challenge the King for positioning is Andrew Pyper. Pyper’s most recent novel titled “The Damned” is rapidly becoming a massive success. The 2013 novel has already become a best seller. This is number six and by far the most pleasing to his following. The Writer from Toronto has written the horror story and makes no apologies. The book follows “The Demonologist” which established quite a fan base for the writer who is beginning to delve more deeply into horror genre, but without the commercial nonsense that many come to expect. He’s not prone to cliche and you’ll have to read it to find out how he makes use of throwing curves so you won’t really know what’s coming up. (11) BANGARANGING ON. The Washington Post’s Ada Tseng interviews Dante Basco, who played Rufio in Hook (an orange-mohawked guy who was killed by Captain Hook in the film), and has now made a short-film about Rufio, Bangarang, which is available online — “Remember Rufio in ‘Hook’? The actor is trying to keep his cult character’s legacy alive.”. Basco has a cameo in the film, but is too old to play the young Rufio. A new generation of kids now knows him better for his voice-over work as Prince Zuko in the Nickelodeon cartoon “Avatar: The Last Airbender.” But he still gets recognized by “Hook” fans every single day. For a writer searching for his voice in the midst of corporate conservatism during the late 1950s, the creative horizon seemed elusive at best. Television, although still a youthful medium, had begun to stumble and fall, succumbing to the pressures of financial backing and sponsorship in order to survive its early growing pains. Navigating a successful career through a cloak of fear and indecision became problematic for a young writer struggling to remain relevant. Rod Serling had penned several landmark teleplays for The Columbia Broadcasting System, including Patterns, and Requiem For A Heavyweight, but the perils of network censorship were beginning to take a toll on the idealistic author. As his artistic voice and moral integrity became increasingly challenged by network cowardice, Serling found his search for lost horizons alarmingly elusive. (13) HALF CAST. Stewart Clarke in “Second ‘Fantastic Beasts’ Film Starts Shooting as New Plot Details Emerge” on Variety, says that the second Fantastic Beasts film will be set in Paris in the 1920s and will have Jude Law as a young Albus Dumbledore. The studio offered new details of the upcoming film, which will see Eddie Redmayne return as magical beasts lover Newt Scamander to take on Gellert Grindelwald, the dark wizard played by Johnny Depp, who was unmasked at the end of the first movie. Jude Law will star as future Hogwarts headmaster Albus Dumbledore in the film, a younger version of the character originally played by the late Richard Harris and Michael Gambon in the Harry Potter films. The sequel moves the main action to 1920s Paris, shortly after Scamander’s capture of Grindelwald at the end of the first installment. @LUCIFERwriters fyi a Hugo award is very heavy and pointy and would make an excellent murder weapon. Fictionally. In fiction. Not real life. This entry was posted in Pixel Scroll and tagged Andrew Pyper, Batman, Dwain Kaiser, Fantastic Beasts, J. K. Rowling, J.R.R. Tolkien, Jerry Pournelle, Lord of the Rings, Myke Cole, NASA, Ray Bradbury, Rod Serling, Stephen King, Steve Vertlieb, Thor, Twilight Zone by Mike Glyer. Bookmark the permalink. What’s that? It’s time for another Meredith Moment? Why of course it is! The Iron Ship (The Gates of the World #1) by K.M. McKinley from Solaris (uses DRM) is on sale for $0.99 in the U.S. The description intrigued me quite a while ago. It’s got a mixture of magic and science (more magic, it sounds like? but they’re on the trail of lost science from an extinct civilization!) and an ambitious, diverse* family at its center. * By which I mean: one’s a soldier, one’s a bureaucrat, one’s a priest, et al. ETA: #2 in the series came out in December. ETA again: The cover art (by Alejandro Colucci) is nifty. In more general terms, now that Russia is a Christianized authoritarian stature, many conservatives see it as worthy of emulating, and their “assistance” as helping bring about the same in the US. @Rose Embolism: just so. Similarly, since Russia no longer even talks about socialism, all the types who thought they might be hurt by real socialism are cheering; they think that they (unlike Russian oligarchs) can still control our government. (6) There is a very extensive list of approved grave symbols, here’s a link to a version that resembles the handout they gave me when I buried dad. I’d pick the one with the sheep holding a flag, just for the WTF? factor of it. I’d give the sheep a stovepipe hat and Groucho Glasses, though. Sorry about that. Yes, I should be more careful about splash damage in what I say. Mostly it was just my recollection of Pournelle being intolerably smug about the free stuff, which most reviewers try not to be. Any recommendations for or against Cole? I must admit to a weakness for demons. I just called mine “bribes” in the reviews. Kept things in perspective, I thought. I’d pick the one with the sheep holding a flag, just for the WTF? factor of it. I presume that the “sheep holding a flag” is a Paschal Lamb. Its basic symbolism is of Jesus as the “lamb of God”, but I can find some references indicating that it may sometimes be used specifically as a Masonic symbol. Some people might have a WTF reaction, others would make assumptions about your affiliations on that basis. For what its worth, I have a fond memory of Pournelle Dean Ing at a deserted convention meeting room, teaching me how to drink bad vodka (very quickly, before you taste it). At least I think it was Pournelle; After the fifth shot my memory went fuzzy. I’m pretty sure it was a bipedal hominid, at least. @kathodus: if you mean Myke Cole — I read his very first and thought that high command was implausibly stupid (which may be his cynicism from the field, or just a demonstration that you making the truth believable in fiction is seriously hard). I’m probably going to try the new one because I’ve met him a couple of times and think he has his head on straight enough for a new line to be worth a try. @kathodus: I enjoyed the first couple of novels in Myke Cole’s first series, though I blush to admit I haven’t finished the conclusion (life/distractions and just haven’t gotten back to it). I haven’t read the follow-up series (which IIRC takes place before). I’m interested to see what he does in a new genre. My grandfather is buried in Arlington with a stone bearing a wreath of wheat, presumably honoring his war work. He was a botanist working on wheat hybridization, and improving farm yields, and the like. I don’t know how he even ended up in Arlington since he failed to finish at West Point (Class of 1892!) and went off to academia instead. Literally, he hung out with classmates who ended up as generals, and never missed a parade.